At Starkwood we love where we live and work. The city of Portland, Oregon is full of interesting places to go, good food to eat, and exciting things to do. It’s this love for our great city that inspired us to research and write a little about the history of Portland and share it with you, here on our blog. We hope you enjoy it half as much as we enjoy living here. You only have to spend a few minutes in the bustling city of Portland to know that it has a rich and dynamic history. From the beautiful buildings downtown to the sprawling forests and parks, there are few places in the world that combine city living with the beauty of nature so well. In recent years, Portland has become a haven for young artists, foodies and musicians. However, Bridgetown wasn’t always the bohemian utopia that it is today. In fact, it was once known as one of the wildest and most unscrupulous places in America. Some history books say that the discovery of Portland took place in 1805, when Meriwether Lewis and William Clark explored the area. However, this doesn’t account for the rich oral history of the Chinook Native American tribe inhabiting the Northwest who had settled along the Willamette River and Multnomah Falls long before the Lewis and Clark expedition. The Upper Chinook had their own names for these landmarks, but once the settlers started moving in from the Oregon Trail, new ones emerged. A nickname that remains today is ‘Stump Town, due to the large amount of trees in the area. 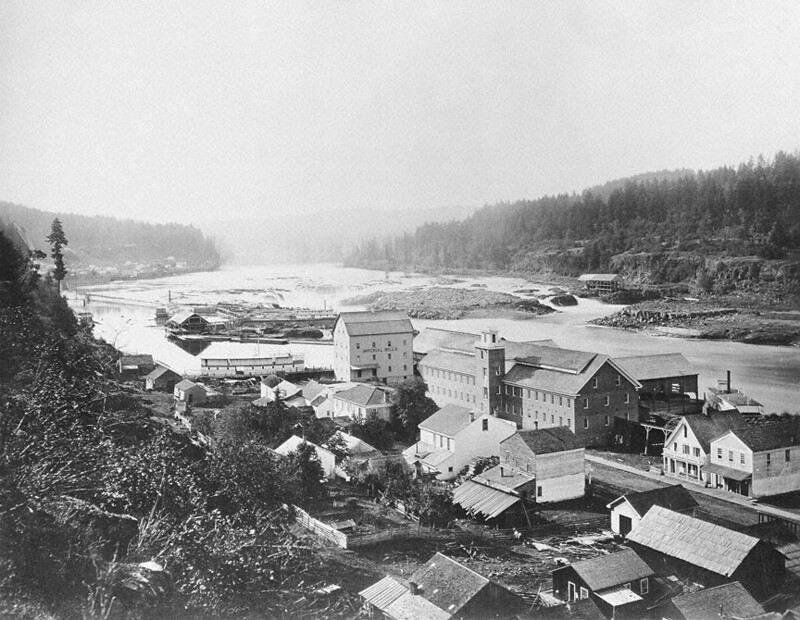 The site of the future city of Portland, Oregon, was known to American, Canadian, and British traders and settlers as “The Clearing.” It was a small stopping place along the west bank of the Willamette River used by travelers journeying between Oregon City and Fort Vancouver. Brave pioneers and wealthy adventurers from the East Coast traveled to the city in droves to start new lives and invest in its abundant resources. Two such men, Maine merchant Francis Pettygrove and Massachusetts lawyer Asa Lovejoy, wanted to name the city after their respective hometowns of Portland and Boston, and determined the choice via a coin-toss. Known as “The Portland Penny,” the deciding copper piece is on display today at the Oregon Historical Society Museum. A devastating fire swept through downtown in August 1873. The blaze destroyed 20 blocks along the west side of the Willamette between Yamhill and Morrison and caused $1.3 million in damage, leaving the city in disarray. However, it grew into its namesake and became a popular port, drawing the attention of wild sailors who indulged in drink and the other unsavory activities that were once available in what is now known as Old Town Chinatown. It also became a place where many men and women were ‘shanghaied’ into slavery, giving the port quite an ominous reputation. In 1905, Portland hosted the Lewis and Clark Centennial Exposition, a world’s fair. This event increased Portland’s renown which contributed to a doubling of the population of Portland, from 90,426 in 1900 to 207,214 in 1910. Portland experienced an economic boom in the 1940s, leading to the development of the Waterfront. In the 1990s it began to be known as a haven for artists and creatives, due to its cheap rent and booming cultural industry. Despite recent economic downturn, Portland’s art, culture and food scene continues to flourish and is a big part of Portland’s ‘Keep It Weird’ philosophy today. The city continues to grow from strength to strength, due in part to the adventurous and unique spirit of its inhabitants. We’ve come so far and we can’t wait to see where we go!